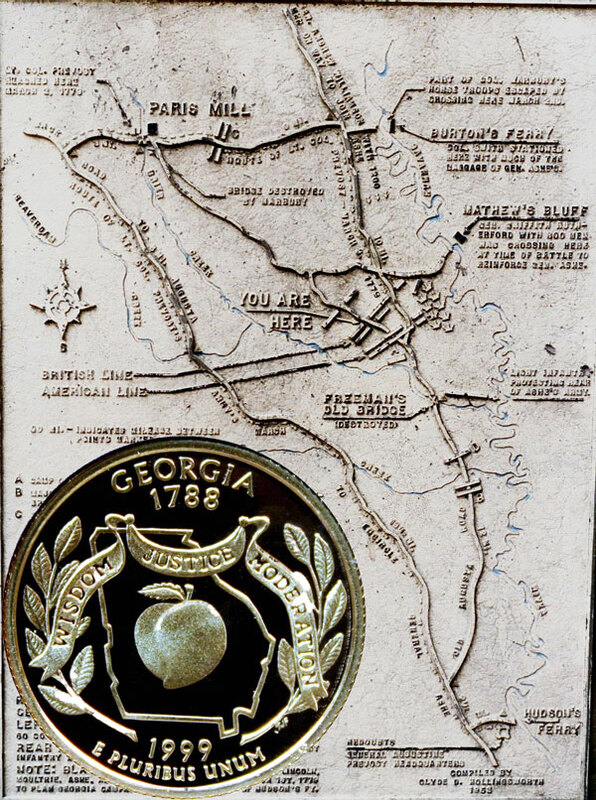 Today, the Georgia State Quarter Coin tells the story of the Battle of Brier Creek 236 years ago. Though Savannah had fallen to the British, the Americans had recently enjoyed success at the Battle of Kettle Creek. But on March 3, 1779, the British surprised and routed General Ash’s American army camped near Brier Creek. William Bacon Stevens included in his History of Georgia (1859) the Battle of Brier Creek and a disapproving description of the General Ash’s efforts. The Americans had now a large force along the Savannah River, distributed in several camps. At Augusta there were twelve hundred troops under General Williamson; at Black Swamp, seven hundred under General Rutherford; at Brier Creek, two thousand three hundred under General Ash; and at Purysburg, where General Lincoln had his headquarters, were between three and four thousand men,—making, in all, a force of between eight and nine thousand. At a consultation, held at General Rutherford’s camp, it was resolved by General Lincoln, and the principal officers, to march the army from Purysburg (leaving, however, a strong guard there to watch the enemy) to General Rutherford’s, at Black Swamp,—there to cross the river and join General Ash, at Brier Creek. The position occupied by General Ash at the creek, was deemed by him perfectly secure, and he even believed that the enemy, having magnified his numbers, were afraid to cope with the troops under his command. On the other hand, the British commander, anticipating that the troops at Brier Creek might soon be joined by the main army, and feeling the ill effects which their presence had upon his movements, shutting him up so closely within his lines, he deemed it advisable to strike at General Ash before he could be reinforced, and thus prevent the attack which General Lincoln designed to make with his whole force upon the British at Hudson’s Ferry and Ebenezer. The plans of the enemy were secretly, but most effectively laid. To draw off attention from the main attack, which it was designed should be on the American front, Lieutenant-Colonel Prevost, with the 2d battalion, took a circuitous route of fifty miles to cross the creek above them, as if to turn their flank and gain the rear of the Americans; while, to keep General Lincoln in ignorance of their main design, General Prevost made a feint on the river bank, as if he purposed crossing the stream. The attacking columns found some difficulty in getting into their proper position, owing to the swollen current and the absence of bridges which they themselves had previously destroyed; but, on the morning of the 3d they were ready for action. Three grenadier companies of the 60th regiment; one of light infantry, under Sir James Baird; the 2d battalion of the 71st regiment; a troop of light dragoons, a body of provincial rangers, &c., with five pieces of artillery, numbering in all one thousand, moved on to the scene of slaughter. General Ash was not prepared for such an encounter, encamped as he was in a place totally unfitted for defense. On his right was a deep lake, made by the overflowing of the surrounding streams into the low and matted swamp. On his left was Brier Creek, swollen, rapid, and impassable by recent rain; and his rear was bounded by the Savannah, with not a boat to cross it; while his only means of exit from this trap, into which, with entire lack of military skill, he had led his troops, was by an open field in front, and even this he had failed adequately to secure. Not suspecting his danger, he had sent off two detachments, one under Major Ross, of 300 dragoons, to reconnoiter the enemy at Hudson’s Ferry; and the other under Colonel Marbury, to watch the upper pass of Brier Creek. This latter officer discovered the van of Prevost’s army, and exchanged a few shots with them at Paris’s Mills. He instantly sent an express to inform Ash of the near approach of the enemy, but the rider was captured, and it was only by a vague rumor, transmitted to the General by General Elbert, that he had any idea of their proximity. The enemy had then advanced almost to the picket guard at the bridge, about a mile from the main body, and when the drum sounded to arms, as that body of one hundred fled before the British van, not a soldier or piece of artillery had been served with cartridges, and not a plan of any kind had been formed for action. The confusion of the camp may well be imagined. Ash attempted to rally his troops under three divisions, but, as he confessed, they did not stand fire five minutes, and most of them shamefully fled, the General at full speed leading the way. The only portion of this ill-fated army that did stand their ground was the left division, under Elbert, which fought so gallantly that the English reserve were ordered up to support the line of attack: not until then, when there was no escape, and resistance was hopeless, did Elbert order his men to ground their arms, and surrender themselves prisoners of war. The surprise and defeat of the Americans were complete. The enemy pursued the routed troops with a vengeance worthy of savages, and the order of Sir James Baird to his light infantry was, that “everyone who took a prisoner should lose his ration of rum,” and thus many, who on their knees implored mercy, were bayoneted by the brutal soldiery, who would not lose their allowance of grog. The loss of the Americans in battle was about 340, killed, wounded, and prisoners, one-half of whom fell dead on the battlefield, or were drowned in the neighboring waters. They lost also one thousand stand of arms. The British loss was very trifling, being only sixteen killed and wounded. A few of the fugitives, including Generals Ash and Bryant, and Colonel Pickens, reached Matthews’s Bluff that evening; and that night, as many as could, crossed over into Carolina. A court of inquiry sat a week after, at the request of General Ash, to investigate the conduct of this officer at this battle; and while, in its finding, the court acquitted General Ash of any want of personal courage, it declared its opinion that he had not taken all necessary precautions to secure his camp, and obtain timely notice of the movements and approach of the enemy. But what shall we think of a General who, with an enemy so near at hand, and with two hundred dragoons in camp, should allow himself to be so surprised that not fifteen minutes elapsed from the alarm to the attack? Indeed it is fully evident that General Ash was deficient in almost every requisite of a commanding officer, having neither judgment, skill, foresight, nor self-reliance; and, notwithstanding the judgment of the court, wanting in personal bravery. It was more than suspected by many that he had betrayed his army and his place of encampment. The disposition of his troops and defense, his dilatory movements, and his precipitate flight, certainly gave strength to a report which obtained a very general credence. How unfortunate was it for Georgia that she should have had in her armies as her defenders such men as Howe and Ash, men totally incapacitated for their responsible duties, and whose errors and cowardice brought disgrace and ruin upon the State. The Georgia State Quarter Coin shows against a background of the map of the battle drawn by Clyde Hollingsworth, circa 1958.